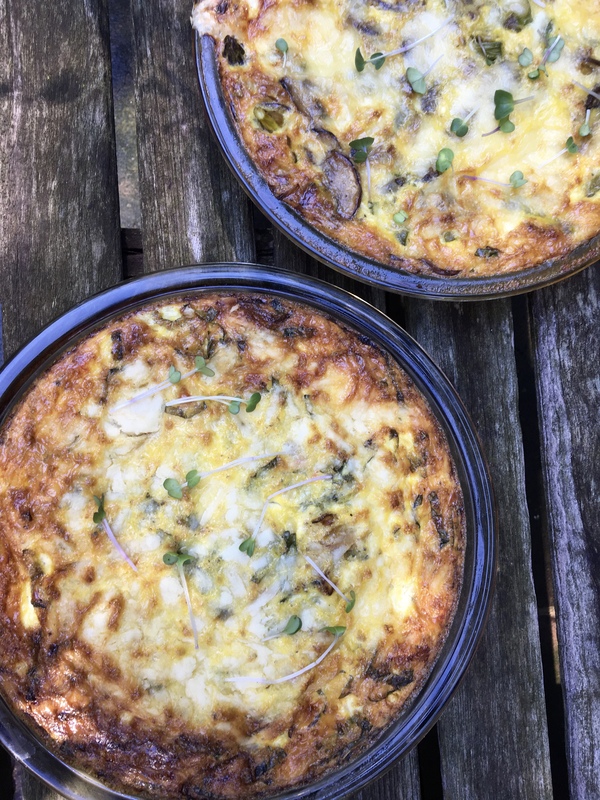 Frittata’s are an easy and classy option for brunch. It’s also easy to personalize. The delicious combinations of herbs, cheese and veggies are endless! Grease a 9 inch pie dish with butter. In a saute pan, heat olive oil over medium high heat. Add the onions and saute until they start to brown slightly. Turn the heat to medium low and stir the onions occasionally, until they are golden and caramelized. Season with salt and pepper. In a large bowl, whisk the eggs, sour cream and 3/4 cup of the cheese. Stir in the sun dried tomatoes, basil, and cooked onions. Season with a generous pinch of salt and a few grinds fresh pepper. Pour into the prepared dish. Sprinkle the remaining 1/4 cup of cheese. Bake in the oven for 20-30 minutes, or until the eggs have set and look golden. Serve hot or room temperature. Enjoy! Swap the cheese, filling and herbs to make your perfect frittata. My other favourite combo is gruyere, thyme, mushroom and asparagus!